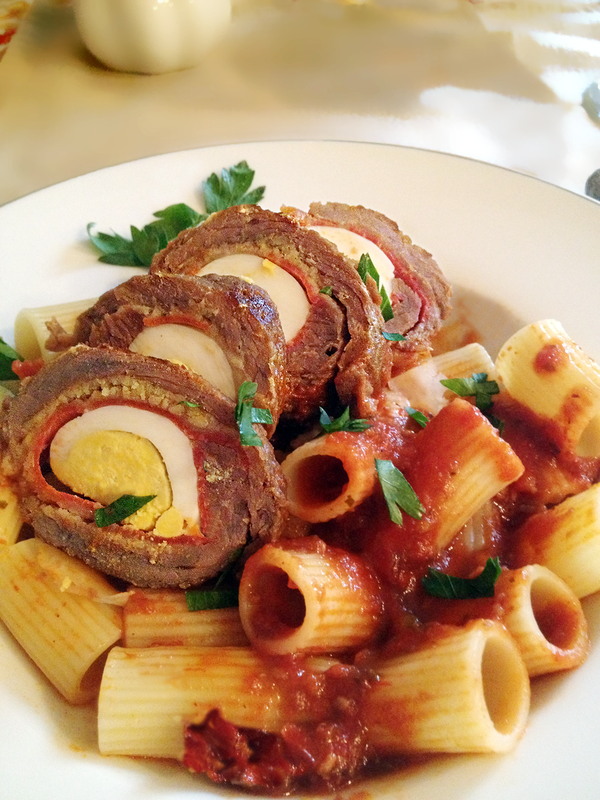 If you're not familiar with it, think of braciole as frugality all dressed up for Sunday dinner! It's usually reserved for special occasions but make no mistake, this is peasant food. The ingredients are relatively inexpensive, so visit your butcher and grocer to buy top quality local, organic ingredients. "What's with the egg? ", you ask. The best answer I ever heard was that it makes the meat "go further." I believe it. This is a stick-to-your-ribs, protein-packed meal with beef, prosciutto and cheese wrapped around an egg. Come to think of it, it's a lot like turducken -- Sicilian style! My recipe makes eight individual braciole. Fillings can be switched or omitted to accommodate dietary preferences -- just make sure to change the way you tie each bundle so you know what's inside. There's a fair amount of prep to this dish but it works to your advantage. Just make it well ahead of dinner time and keep it basted with tomato sauce throughout. The flavors develop, the meat will be even more tender and you'll enjoy a relaxed dinner (and a clean kitchen) when the time comes. I wanted you to see what the braciole looks like when it's sliced so I photographed one that way. It's not the way I serve it though. Cutting the braciole causes it to cool too quickly for me. View the recipe inside for a picture of how it usually looks on the plate. I served it, this time, with rigatoni, Caesar salad and a 2009 Oregon Pinot Noir from the Territorial Vineyards in Eugene, Oregon. Time: 40 minutes prep, 2 hours cooking. If you follow A Kitchen Takes Root on Facebook, you know that I got some Red Ape Cinnamon last week. I've had a cinnamon apple jones ever since! Make these for brunch, breakfast or dessert. 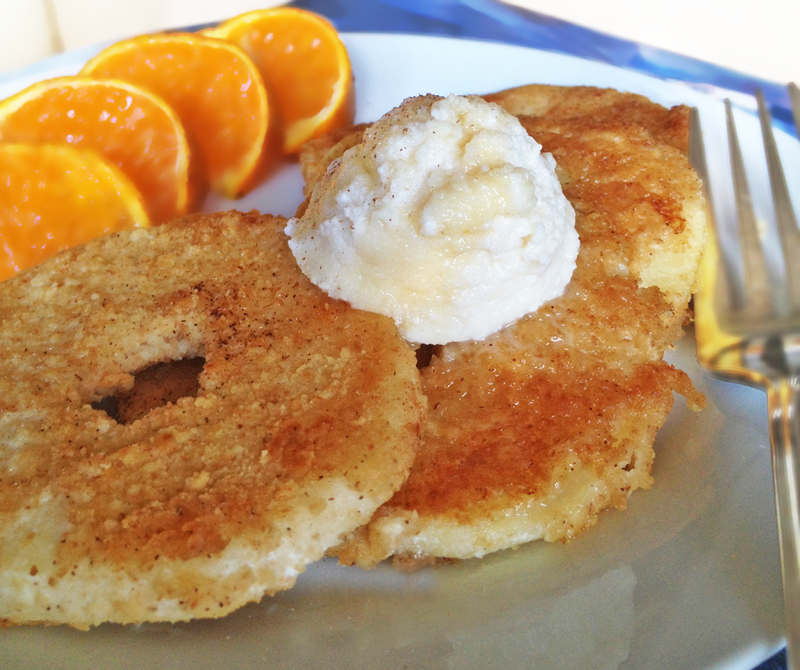 This time I served them as a light breakfast with an organic honey tangerine on the side. The ricotta topping and the yogurt "batter" add some protein to the meal. This time, I used graham cracker crumbs instead of nut flour, but they're great either way. These are great baked (350 for about 7 minutes) -- but, unless you're cooking a lot of them, it's a waste of energy to heat the oven for so few minutes of cooking time. My solution is to use a skillet with a little oil, (as if you're making pancakes) cover it, and let the apples cook on a medium-low heat until they're tender-crisp. You'll be surprised at how much these taste like an apple fritter! It's been a long time since grilled cheese made its way to my table but today is National Grilled Cheese Sandwich Day and I understand my role here. Here's my version of that old standby that we used to make with American cheese and white bread. 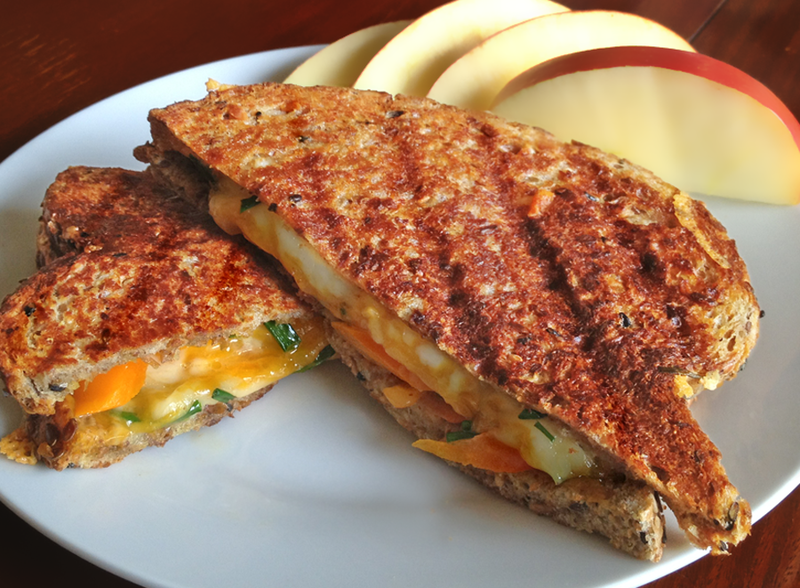 This grown up version combines deli gouda, as well as Tillamook provolone and cheddar cheeses. I've grated them and mixed in some chopped chives and an orange pepper for sweetness and a little crunch. You'll notice the grainy bread, too. You can't go wrong with Dave's Killer Bread for flavor and texture. Now, I wouldn't exactly call this health food, but it's all organic, mostly local, and full of fiber and flavor. Best of all, I found out that my George Foreman grill makes a pretty decent panini press in a pinch! Serve it with apple slices because, well, what goes better with cheese? 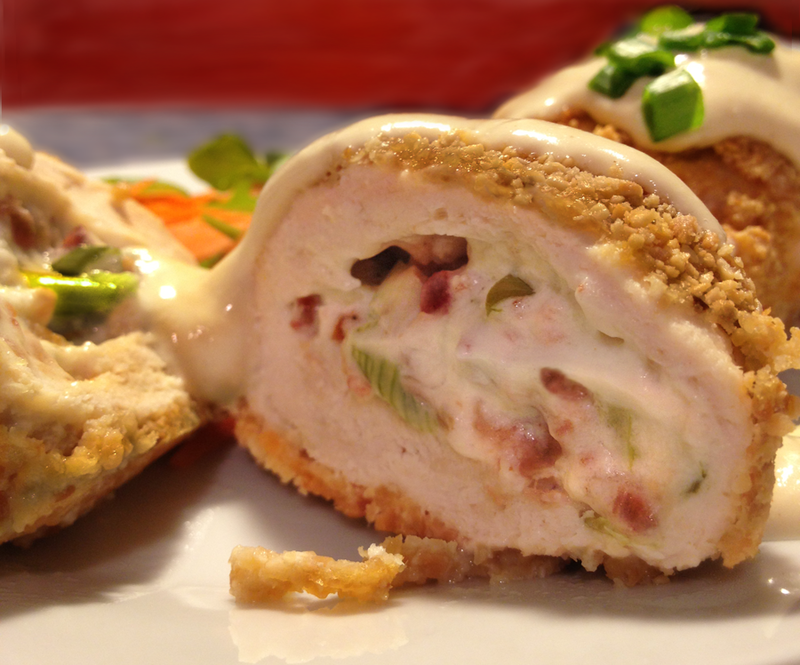 Last Thursday was National Chicken Cordon Bleu Day. Really. Did you miss it? Yeah, me too -- but I made this last night anyway. If you've been reading the blog you know that I look to the locals for inspiration. In this case, I decided to make it with local chèvre (from Fraga Farms) instead of Swiss cheese, and I substituted the sliced ham with uncured bacon. I also ditched the bread crumbs and used ground hazelnuts instead of wheat flour. I topped it with a simple Dijon and mayonnaise sauce. If you haven't tried that, you should. It's a little tangy and so easy to make that it might become your go-to sauce for fish and poultry. I think the best part is that it's not fried and still, the skinless, boneless chicken breasts come out of the oven juicy and tender. If you have a budding cook in the house, try this one. It's easy to make, much healthier than traditional Chicken Cordon Bleu and it looks so special that it instills confidence. I love fruit in salad! These days the weather has been so warm and dry that I've been making a lot of salads as the main dish. I don't generally think of adding fruit until Summer when locally grown fruits are available and tempting me from the market. The Orange Poppy Seed Dressing is about as easy as it gets, and the subtle tang of the orange juice really adds a lot to the flavor. It's great on a spinach salad as well. 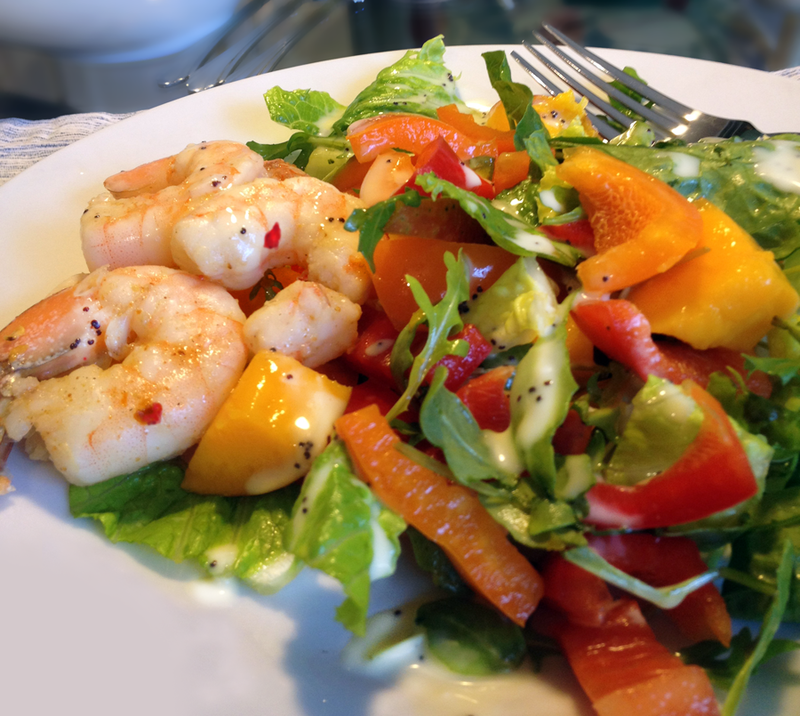 I served it with with seasoned shrimp but you may opt to make this a vegetarian dish and add black beans directly to the salad. My friends brought a bottle of Sweet Cheeks Pinot Gris and it was perfect for lunch on a sunny day.